The Queensland Museum and Queensland Art Gallery are located within the Queensland Cultural Centre Complex at Southbank, Brisbane. Both institutions began collecting in the latter part of the nineteenth century and their collections consist of a diverse range of irreplaceable objects and artworks. Initially, the Queensland Art Gallery's Collection Policy placed more of an emphasis on British works. However, this has developed over the years and its collections now include contemporary and modern art, indigenous and non-indigenous art, as well as three-dimensional sculptures and 'installations', object des-artes as well as artworks by the 'Masters' and other objects too numerous to mention. The Queensland Museum's initial mandate was as a natural history museum but it has also developed and is now recognised as both a natural history and cultural heritage museum. The Queensland Museum includes collections of type specimens and wet specimens, fossils and minerals, archaeological material from both land and marine sites, history and technological objects and other cultural material including Aboriginal and Oceanic collections. The purpose of this paper is to present a summary of the application of non-destructive techniques employed in the Queensland Museum and Queensland Art Gallery Conservation laboratories. It is not intended to be a technical presentation but it is hoped that it may raise awareness and promote further opportunities for the collaboration of the non-destructive testing community with the conservation profession. The role of Materials Conservation in both institutions is twofold. Firstly, its priority is to preserve the collections in their most authentic condition for future generations. Secondly, and equally importantly, it is responsible for contributing to, or assisting in, the research associated with the objects in the collection. At times this may be in response to a curator's questions. They may require information on the works authenticity, they may want to know more about its method of construction or other underlying information. Non-destructive testing can provide information on technique, age, composition, condition and structural components. Alternatively, the conservator may need information on the stability or underlying condition of the object. This information is essential in developing the most appropriate treatment proposal for an object. Visual examination is the basic technique used in materials conservation for the thorough examination and assessment of objects. It is often so elementary that at times it may be overlooked. Table 1 lists the three types of lighting used to assist visual examination and the details they reveal. It is not intended to go into this aspect of examination further except to note that the most comprehensive examinations of objects are the result of a combination of non-destructive techniques. Each technique provides information about an object from an alternative perspective. Assessment always begins with visual examination. Magnification is also commonly employed within the non-destructive testing repertoire. Stereomicroscopy is most frequently used to provide information on fine detail, composition and texture. It is also essential if for any reason a sample of material is required for other analyses. At times polarised light microscopy may be used to gain information on the different light properties of a material for example different textile fibres behave diagnostically under polarised light. Photomicrography and Photogrammetry are associated with magnification and visual examination. Photomicrography combines photography with microscopy. These images can then be digitised and available for further analysis with appropriate software such as Paint Shop Pro®. Computer assisted photogrammetry has also been used to record the current condition of an object or a field site. This record can then be stored digitally and utilised as the benchmark to quantify changes in condition or structure with time or treatments. This technique will be applied to the Lark Quarry Dinosaur trackway outside Winton in Central Queensland. Infra-red illumination uses that part of the electromagnetic spectrum that is longer than about 700nm, it merges with microwaves at about 300,000nm and beyond that with the radar band. Most examination and infra-red photography uses that part of the spectrum referred to as the near or actinic band of infra-red that lies between 700-900 nm. Unfortunately, the 700-900nm band, has limited application for the imaging of underdrawing due to the natural absorbence of some pigments in this band. Azurite is basic copper carbonate pigment (2CuCO3Cu(OH) 2) that is found in nature that absorbs in this spectrum. The potential effect of this absorption is to mask underdrawing. However, the infrared band that is greater than 900nm has greater penetrative powers and is able to be used to record details masked by semi-opaque paint. This band can thus be applied to the examination of painted surfaces of canvas on wood, and of textiles, leather and parchment and to examine underdrawing and underpainting. This band is also able to partly penetrate pigments such as azurite. 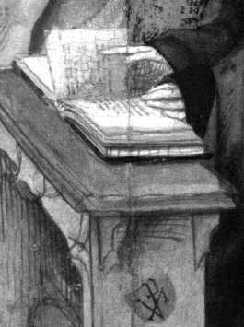 Hence, the vidicon® has been used very successfully to examine underdrawing. The Queensland Art Gallery records infrared images using both infrared film and the vidicon® system. The vidicon® system used by the Art Gallery has a vidicon tube camera with a lead sulphide detector which is most sensitive in the 900- 1400nm region and hence is able to be used very successfully to examine underdrawing. However, since the vidicon® is only able to capture a very small area at any one time, multiple image captures are required to produce a complete reflectogram. The Master of Frankfurt (1460-c.1520-1533) an oil on panel painting required 240 captures to produce the final reflectogram. The individual image captures are processed though a video system and compiled into a digital mosaic by a software package. The Queensland Art Gallery uses Adobe Photoshop to process the individual digital data captures and to produce the final reflectogram mosaic. Ultraviolet radiation has a shorter wavelength than that of visible light. The two bands of the ultraviolet spectrum that are of particular importance in object examination are the UV band (also known as UVA or near UV) from about 320nm to 400nm and the middle UV band or UVB with wavelength between 280 and 320nm. What is actually seen when an object is viewed with ultraviolet radiation is not the UV rays reflected from the surface, but the reflected visible light resulting from UV rays that reach the surface but are subsequently reflected as radiation of longer wavelength. This general phenomena is known as luminescence. It is referred to as fluorescence if the reflection lasts only as long as the incident or exciting ray. By comparison, if the effect persists longer than the exciting ray it is known as phosphorescence. Ultraviolet frequencies can excite fluorescence in pigment materials and is consequently used for the non-destructive analysis of minerals and pigments (Graham et al, 1985). It has been used to clarify over-written or partly obliterated inscriptions. It is the so called black-light that is commonly used to view 'invisible' signatures. It can be applied to restored objects to detect old adhesive and previously restored areas. Similarly, in paintings conservation ultraviolet fluorescence has long been a standard technique for detecting overpainting, revarnishing, repainting, cracks, covered writings and past restorations. The Queensland Art Gallery uses Daylight film and Kodak Wrattan filters (2E and cc20Y) to photograph objects using ultraviolet lighting. 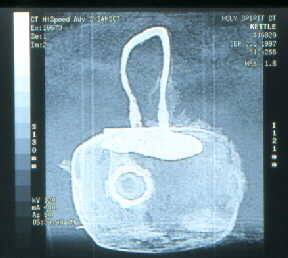 Radiography is the most frequently utilized technique for the examination of metallic objects (Cronyn,1990). It is also a valuable tool in the examination of paintings. X-rays are of even shorter wavelength than ultraviolet radiation and hence are able to penetrate materials that are opaque to both visible light and ultraviolet radiation. The x-rays are absorbed or pass through various materials depending on their density. Hence a metal is more dense to x-rays than its corrosion products, and lead corrosion products are more dense than iron metal and silver is more dense than iron metal. Similarly, the components of a painting examined by radiography will undergo varying absorption depending on their density, thickness and composition and the wavelengths of x-rays utilised. Characteristics of the canvas can provide information on its provenance and age and will clearly show additions to the canvas. 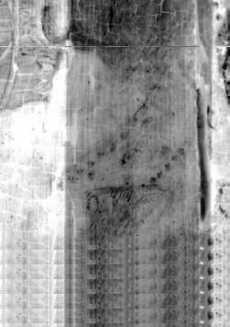 Radiographs of wood panels can be diagnostic of the wood used, evidence of damage by insects and the position of nails and stretchers used in the construction of the painting. A radiograph is also able to visualise another painting below the visible one. It will also reveal fine cracks, the 'craquelure', of a painting which vary in size, and are created over time due to varying tensions between the painted layer, the ground layer and the canvas or panel. Pigments in paintings will also absorb x-rays differently depending on their density and atomic weight. A pigment containing lead or mercury will absorb more x-rays than those containing chromium or cobalt. Aniline pigments absorb x-rays only to a very slight extent and at times virtually no radiograph image will appear. Other factors including variations in paint thickness will also effect the radiograph that is produced (Fleming, 1975). The kilovoltage range used for paintings is commonly in the vicinity of 15 to 30 kV (up to about 60kV) and 2.5mA, for approximately 1 minute. In comparison, three dimensional objects such as a metal object from an archaeological site may require an initial radiograph of the order 60-80kV and 8mA, for 90seconds depending on its density and other factors. The examination of an artwork such as The Master of Frankfurt illustrates the information that the Queensland Art Gallery can gather through non destructive techniques. The Master of Frankfurt, is a Netherlandish panel from the Queensland Art Gallery's collection. It was painted by the Master of Frankfurt and his studio, c1460-1520/33, using a mixed technique of egg tempera and oil glazes.It shows the Virgin and Child with Saint James the Pilgrim and Saint Catherine and the Donor c.1496. Initial examination of the painting using radiography (figure1) revealed that a bowed woman's head with head shawl (St Anne?) had been overpainted with the head of a ruddy faced man ( possibly as a tribute to the donor). It is known that this painting was cleaned in the early 1970's. It may have been at this time that the man's coat on the donor figure was cleaned to reveal a woman's dress. It is likely that the restorer realised there was not much left of the woman's face and so did not continue to clean off the overpainted male face (Refer figure 1). Recent investigation using the IR vidicon® has given the Art Gallery conservators more clues to the making of the painting. From the infra-red examination, the underdrawing has revealed that the artist's modifications have altered the signage of the saints. These modifications have included the overpainting of St Cornelius's horn with a key to signify St Peter. St James previously appeared as St Joseph. The figure of St Joseph was wearing shoes (it is now barefoot) , there had been a tear falling from his eye and the head was bare. In the modifications the shoes were removed and a shaggy hat with a scalloped edge was painted onto the bare head, these features now assign him as Saint James. Figure 2 shows a detail image of the artist's changes to the position of the hands and ring of one figure. Whilst the examination of the painting has revealed these major changes to the significance of the painting, they are quite complex, and their meaning has not yet been resolved. What is known however, is that this artwork is a (rare) document of the modification of a stock panel for a specific patron, the story of which is still unfolding. 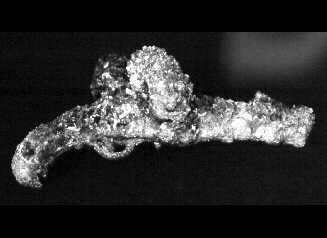 Radiography has been invaluable in determining the extent of metal remaining within concreted objects recovered from shipwreck sites (Refer figures 3,4). This technique is essential to determine the treatment approach including the extent and method of cleaning. Stone, marble, ceramics and other three dimensional objects can be examined using radiographs to reveal old repairs and infills, internal armature and shape, and the constituent components of the object including evidence of corrosion or other deterioration. For very dense and large objects, or where power is not available then gamma radiation is used instead of x-rays. Gamma-rays have shorter wavelengths than x-rays and are therefore more energetic and able to penetrate an object more deeply. Gamma- rays are produced by decaying radioactive isotopes and hence can also be used where there is no access to electricity. It has been very useful to examine the internal wing structure of historic aircraft and also large blocks of coralline concretion, one of which contained a 24 pound carronade dated pre 1791. 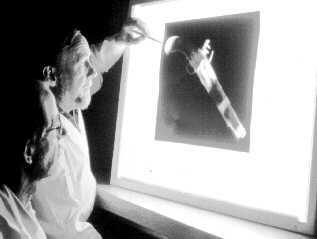 Tomography is the medical technique whereby x-rays are focussed on a point within an object (Cronyn,1990). The technology was then developed to the extent that the focus point was moved at very small intervals throughout a 'body' or object, this information was recorded and analysed by computer software. This progressed to where an x-ray source rotated around the 'body. 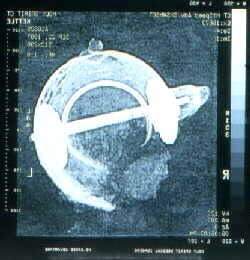 Hence, this technique was referred to as Computerised Axial Tomography (a CAT scan). This is now more generally referred to as Computed Tomography (refer figures 5,6). It is able to reconstruct images by measuring attenuation along rays from the x-ray source. Computed tomography (CT) techniques enable two- and three-dimensional external and internal visualisations of an object. X-ray and gamma-ray CT can provide information about the spatial distribution of mass density, atomic number and chemical species within objects down to the micron level. Due to its expense this technique is only a recent addition to the Conservation repertoire but is certainly developing and opening up the non-destructive testing that is possible on irreplaceable museum and gallery objects. In addition to the non-destructive techniques discussed above, Conservation also carries out tests to determine if a product or material used in the storage and display of objects and art works may contribute to its deterioration. Whilst, this is not an example of a non-destructive test per se, it is an essential tool used by conservators to minimise potential damage to objects in our collections. Hence, for material conservation purposes these tests may be considered under the banner of tests that pose no risk to the object and in fact ensure that materials used will be non-destructive. It has long been known that materials and products in association with objects can contribute to deterioration (Hatchfield,1987). Organic acids including formic acid and acetic acid are detected using a number of visual testing methods. Other tests are utilised to detect additional chemicals released from materials and products. A selection of these methods and their details are summarised in Table 3. The purpose of this paper has been to present a summary of the application of non-destructive techniques employed in the Queensland Museum and Queensland Art Gallery Conservation laboratories. It was not intended as a technical presentation however, it is hoped that it will raise awareness of the Materials Conservation profession and promote further opportunities for our collaboration with the non-destructive testing community. The preparation of this paper would not have been possible without the generous assistance and input from the Queensland Art Gallery Conservation Section. A special thanks is extended to Amanda Pagliarino, Objects Conservator and Anne Carter, Paintings Conservator from the Queensland Art Gallery and Alison Mann, Curator, Collection Manager, Maritime Archaeology, Museum of Tropical Queensland, Townsville for their invaluable input, direction and assistance.